The Chang’e 3 lunar lander and moon rover is part of the second phase of China’s three-step robotic lunar exploration program. China's mission to robotically land on the moon next month is sure to stir up lunar dust, but it may also cause a political dustup, too. China is in the final stages of preparing its robotic Chang'e 3 moon lander to launch atop a Long March 3B rocket, slated for liftoff in early December. The ambitious mission is built to first orbit the moon, then propel down to a landing site, after which a small, solar-powered lunar rover will be unleashed. An artist's concept of NASA's Lunar Atmosphere and Dust Environment Explorer (LADEE) spacecraft orbiting the moon and preparing to fire its maneuvering thrusters to maintain a safe orbital altitude. Image released August 15, 2013. LADEE is designed to study the moon's thin exosphere and the lunar dust environment. However, there is concern that China's ambitious Chang'e 3 mission could impact LADEE's science goals. "The arrival of the Chang'e 3 spacecraft into lunar orbit and then its descent to the surface will result in a significant contamination of the lunar exosphere by the propellant," saidJeff Plescia, a space scientist at Johns Hopkins University's Applied Physics Laboratory in Laurel, Md. Plescia also chairs NASA's Lunar Exploration Analysis Group (LEAG), chartered to assist the space agency in planning the scientific exploration of the moon. While Chang'e 3's mission will create some problems for LADEE — in that the spacecraft would measure not only the native exosphere, but also the Chinese spacecraft's propellant — it also creates a unique opportunity, Plescia told SPACE.com. Sinus Iridum area of the moon. It is likely that China will land a rover near Laplace A crater. Arrow shows location of Soviet Lunokhod 1 rover. "Propellant will be released at a relatively high altitude from burns as the Chang'e spacecraft enters lunar orbit and then at a range of altitudes as the spacecraft descends to the surface," Plescia said. "LADEE will be able to observe how the propellant becomes distributed into the lunar exosphere and then how it is later removed." LADEE also has the potential to measure dust that might be lofted above the lunar surface by the Chang'e 3 touchdown, he said. That big nozzle on the bottom of the Chinese lander, Plescia said, should produce a significant plume on the surface. "We see plume effects at every landing site, human and robotic," he said. Clive Neal of the Department of Civil & Environmental Engineering and Earth Sciences at the University of Notre Dame in Indiana has a similar point of view. It is possible that Chang'e 3 could severely compromise the LADEE mission, Neal told SPACE.com. That's because LADEE is slated to establish a baseline evaluation of the moon's exosphere, something that may not be completed by China's robotic landing, Neal said. 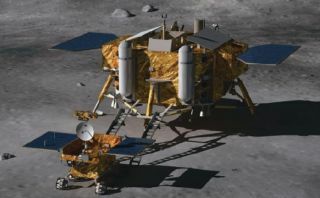 "Conversely, with some sort of communication between the missions, including NASA's Lunar Reconnaissance Orbiter (LRO)," talk between countries could enhance both LADEE and Chang'e 3 investigations, Neal said. High-definition images of what appears to be the preferred landing spot for Chang'e 3 — called Sinus Iridum — were snapped by China's Chang'e 2 lunar orbiter in late 2010. Meanwhile, China's state-run Xinhua News agency has been hosting an online poll, calling on the public to select the rover's name, with "Seeking Dream" in the lead after more than 500,000 votes. Laplace A crater and nearby wrinkle ridge (diagonal at across lower right). The question mark shows a potential landing site from which the rover could traverse Northwest across the ridge to the edge of the crater. The rover will patrol the surface for at least three months under control by scientists on Earth, said Ye Peijian, chief commander of the Chang’e-2 and Chang’e-3 missions, according to the Xinhua. Mark Robinson of Arizona State University's School of Earth and Space Exploration is eagerly awaiting China's first lunar landing attempt. Robinson is the Lunar Reconnaissance Orbiter Camera (LROC) Principal Investigator on NASA's Lunar Reconnaissance Orbiter. If indeed China's lander/rover successfully digs its legs into and rolls around Sinus Iridum, Robinson said the site is "a great place to rove!" Robinson added that the exact landing spot has not officially been announced, but it seems likely the landing will take place in Sinus Iridum, near the fresh crater Laplace A, a feature 5 miles (8 kilometers) in diameter. If so, the Chinese moon machinery won't be alone. The Soviet Union's Luna 17/Lunokhod 1 rover landed nearby in November 1970 and is 155 miles (250 km) Southwest of Laplace A.The now-stilled Lunokhod was on the prowl for 11 months, relaying views of the lunar landscape to Earth and carrying out soil tests. It is likely that there are critical engineering constraints in terms of landing site selection as well as important science goals, Robinson told SPACE.com. An added bonus, he said, is that there is the sheer grandeur view from the rim of Laplace A. The Chinese rover would get an eyeful rolling up to that rim. It's a sheer drop of more than 5,200 feet (1,600 meters). From LROC narrow-angle cameras, scientists can tell that the crater sports solid material exposed in the upper walls and has seen dramatic landslides that have streamed material down to the crater floor. The crater floor hosts a now-frozen lake of impact melt 1.5 miles (2.4 km) in diameter, Robinson said. Wheeling around the area, the rover will traverse the crater's ejecta blanket, Robinson said, so in a geologic sense, the robot can drive "down" into the crater. Material ejected from deep in the crater ends up near the rim, he said, and rocks from the preimpact surface are thrown far from the crater. So as a rover drives ever-closer to the rim, it can characterize rocks from deeper and deeper below the surface, Robinson said. "No humans or robots have ever visited a fresh crater anywhere near this size on the moon — or Mars for that matter — so the return from this mission has great potential for advancing our knowledge of the moon," Robinson said.